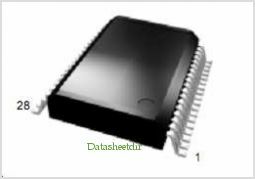 The ARA1400S12 is a GaAs IC designed to perform the reverse path amplification and output level control functions in a CATV Set-Top Box or Cable Modem. It incorporates a digitally controlled precision step Attenuator that is preceded by an ultra Low Noise Amplifier stage, and followed by an ultra-linear output driver Amplifier It is capable of meeting the MCNS/DOCSIS harmonic distortion specifications while only requiring a single polarity +5V supply. By Anadigics, Inc. This is one package pinout of ARA1400S12,If you need more pinouts please download ARA1400S12's pdf datasheet. 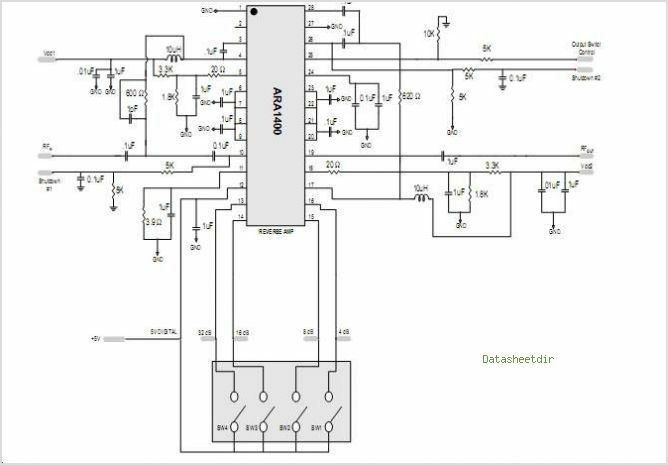 This is one application circuit of ARA1400S12,If you need more circuits,please download ARA1400S12's pdf datasheet. DA0795, Pin Diode 7 Section Attenuator Industries, Inc.